Imagine going your entire life with thick gloves on. These gloves are soft, have great support, and cushion; however, they limit your range of motion. You can only ball up your hand into a fist halfway. You can’t bend your fingers to their full range of motion. You can’t even crack your knuckles. You loose all the strength and range of motion in your hand, slowly but surely. This is exactly what we do to our feet! I encourage my clients to train without shoes on, whether that be in bare feet or the five toe shoes. I’ve done my best to train barefoot in all my workouts, even running when possible, for the past few years now. It’s just as important to have strong, stable feet as it is to have the strength to grip and lift things with your hands. Many people refer to the human body as a machine, it can be trained and strengthened to perform with precision and grace as such. But with any machine, any building or structure, the first thing the builders must do once their plan is done; is build a solid foundation to build off of. Any structure without a solid foundation will be more and more likely to collapse the longer it stands. The longer you walk around with a weak foundation, weak feet, the more aches, pains, and eventually injuries you will have. Just like an old building requiring constant maintenance, the same will be true with your body; in the form of surgeries, physical therapy, etc. As you likely have already figured out, I like to think of things ancestrally. And I know for sure that our ancestors were’t hunting in some fresh Air Jordan’s! Our ancestors feet had to be ridiculously strong and tough. Some researches state that our ancestors made shoes, and that is true for SOME of our ancestors. Although, I doubt their shoes provided any support other than to protect the bottom of their feet from thorns and cuts. Their feet still had to be strong and tough as any. However, there are still some tribes around the world that still live and hunt barefoot. The Khalari Bushmen of Africa are a great example. The Running People of the Copper Canyons in Mexico use tire rubber to make thong sandles with. Their feet and arches are so strong it almost provides a guarantee that they won’t sprain an ankle or tear an ACL. Their foundation is solid so the rest of their body, say for example their knees, doesn’t have to take on anymore stress or strain than it is designed for. Interestingly enough, the rate of lower body injuries, especially ligament tears, sprained ankles, and so on, have gone up dramatically since the 1950’s. A study done in Philadelphia and reported on by NBC, stated that there has been a 400% increase in ACL tears in the past 10 years alone!!! What?!? That’s crazy. So what’s causing this? I think a great example is the game of basketball, I remember suiting up for every practice since I was 13 the same way; tall socks, ankle braces, shorter socks, arch supports, and high top shoes to protect my ankles. I had no idea how much weaker I was making my foundation. Back in the 50’s and before, people played basketball in low top converses. Shoes that have zero ankle support, zero stability, and no fancy shock absorbers. It’s crazy to think about somebody playing any sport or even going for a run in converses now a days. But the craziest part of all of that is we had WAY less injuries back then. It seems like the more "injury-resistant" and "advanced" our shoes become, the more injuries we have. The other aspect of this issue that most people ignore is our fundamental walking and running mechanics. Walking and running heel/toe is not how we were built to function. Babies are the best example of how we should be able to move. Babies do perfect deadlifts and squats when they pick things up. They grip the floor with their toes as they walk, they even try to pick things up with their toes. When is the last time you used your toes? When you got a pedicure? Your toes are meant to be used with every step. Interestingly enough, the body is programmed to use them. Just like your muscles are supposed to fire off in a certain sequence during movements. Your body is programmed to function a certain way, and the fascia lines of your body play a huge role in that. You can follow the fascia lines to find the sequence your muscles should be firing off in. The most interesting thing about the fascia lines of your body is that research is starting to prove that they hold memory. They were designed to move and take a load in certain ways, ways they haven’t forgotten and hopefully never do. 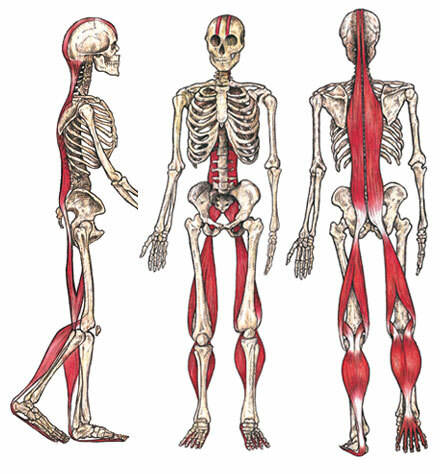 Fascia lines exist all throughout your body, they help support and dictate movement. There is a fascia line that starts at the bottom of your foot and goes all the way up to your head. Using your toes with every step triggers this line, and therefore the correct sequence your muscles should fire off with every step. When you don’t use your toes when you walk/run; you weaken your foundation, put unnecessary stress on parts of your body that weren’t programmed to take on such a load so consistently, and go against your bodies natural design. Using your toes requires your body to load your posterior, you use your calf, hamstring, and even the glute with every step instead of your quads and knees. Your posterior muscles are meant to be the strongest parts of your body, your back should be stronger than your chest, glutes stronger than quads, and so on. To sum it up, start being barefoot as often as possible. But make sure you are using your toes!!! So many people buy 5 toed shoes and start running without first fixing their mechanics, usually only making their physical ailments worse. You must first fix your mechanics! But that is also pretty impossible to do in heavily supported shoes. As with "reactivating" any part of your body, it is a huge mental effort. It will take time for your body to remember to use your toes consistently again, but 3 to 6 months of mental effort is much better than a lifetime of joint pain and injury.